We are honoured to have been featured in the local paper. It may not have been the nicest day to take a spin on a boat on Lake Ontario Wednesday. With high winds and waves white-capping on the lake, a journey wasn't for the faint of heart. But on a MetalCraft Marine Firestorm 50 fire boat, the trip was merely to show the company's Brazilian customer what the boat can do on rough water. The performance of the 15-metre boat and the reputation of the Kingston outfit was enough for the Rio de Janeiro fire department to commit recently to the purchase. And there could be more MetalCraft boats going to the South American country, if a high-ranking official in the Rio fire department has his way. Col. Amadeu Fonseca, commander of the Search and Rescue Unit Marine Division of the Sea, was in Kingston to meet further with MetalCraft officials and take a boat ride on Lake Ontario. 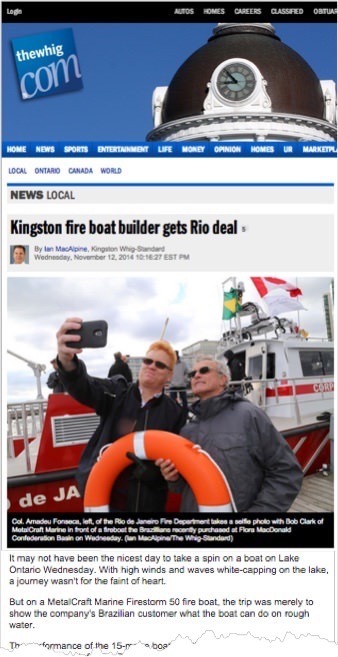 Also visiting Kingston was Brazilian-Canadian Marcus Almeida, who helped broker the deal, and Julio Wuleszny, who handles maintenance of Rio's fire department fleet. They met with MetalCraft officials, including contracts manager Bob Clark, in the boat while docked at the Flora MacDonald Confederation Basin. The Brazilian contingent also met mayor-elect Bryan Paterson, who was pleased a local company had such far-reaching customers. Adorning the top of the boat were Canadian and Brazilian flags. "We know MetalCraft for its quality and, in my opinion, (it) is the best shipyard that constructs fire boats in the world," said Fonseca, handling himself well in an English interview with the Whig-Standard. He added that the economy in Brazil has grown, and with some trade restrictions lifted in the country, it made the purchase easier. Fonseca said he would rather buy from MetalCraft than from businesses in his own country. "Sometimes it's not the equipment we like," he said. "Now we don't have any more restrictions. We are now free to choose the best equipment they have in the world. "Now we have the freedom to make the right choice, to chose the best we could find." With the boat due to be delivered later this year, it will be available in plenty of time for the 2016 Summer Olympics. "We are preparing to give more safety for the people," Fonseca said. "So we're buying the right thing." The Rio Fire department has some other boats, bought about five years ago, but they are not quite as large or sophisticated as the Firestorm model, and Fonseca wants to eventually have a full fleet of the Kingston-made boats. "My idea is to replace them year by year. I don't know how many boats, but we're planning on making this change." According to MetalCraft's website, the Firestorm 50 is a high-speed, aluminum fireboat that can provide more speed, manoeuvrability and pumping capacity than any other speed fire boat currently on the market. "This is a multi-mission boat you can use for everything: search and rescue, combat fires, and transport victims that need medical attention." The Firestorm 50 is currently in use in Alexandria, Va., Camden, N.J., and Miami-Dade, Fla., among other coastal cities. The boat is due to be trucked to Houston later this week and then placed on a special delivery ship. The boat is expected to be in Rio by Dec. 24. Fonseca said his department has to deal with about 160 km of shoreline and be able to travel another 65 km out to sea. Marcelo Andrade, of Lucalex Holdings, a company from Toronto that helps Canadian and Brazilian businesses connect, was the go-between for Rio de Janiero officials and MetalCraft Marine. He said difficulty with paperwork, documentation requirements and Brazilian regulations stalled the project slightly. "Things got lost in translation, not only language-wise but also in terms of business culture in the countries (being) a little different," Andrade said. "I step in to bridge the gaps that exist between the business cultures in the two countries." Clark said on Wednesday that South America is a captive market for them. "This is the first (boat) I believe of many," he said. "There's not a builder in all of Brazil that can build anything like this and no designs close to it." He said the company started looking into Brazil as a potential market about four years ago. Once MetalCraft was comfortable with the rules, regulations and logistics of the market, it hired an agent to find willing customers. And there could be a lot of them down there. Clark said that when he went to Brazil on business recently, he met other officials from different Brazilian fire departments who wanted to know about the MetalCraft product. Unlike in Canada, fire departments are run by the individual states in their country and many have coastlines on the Atlantic Ocean. "Every one of them were interested with the boats." This isn't MetalCraft's first foray into markets other than in Canada or the United States. It is also building fire boats for Kuwait and Australia, and has delivered a variety of boats to Venezuela, Oman, Tunisia and Zambia. "The fire boat market has been strong for us, but it's mainly because we brought new technology to the market," Clark said. Clark said the fireboats could possibly get to fires in the Rio area involving buildings built along the coast much quicker than a fire truck could. "To go five miles could take two hours in traffic," he said of the city with a population of between 11 and 13.5 million in the metropolitan area. "So you can imagine the problem of a fire truck in such congestion." A lot of Rio features narrow roads with no shoulders. "How can they even get through?" Even though temperatures in Fonseca's home town are much warmer than in the Limestone City -- averaging about 30 C annually, compared to about 7 C in Kingston -- he's enjoyed his four visits here over the past year while making the deal. "Kingston is a very good city for tourists." 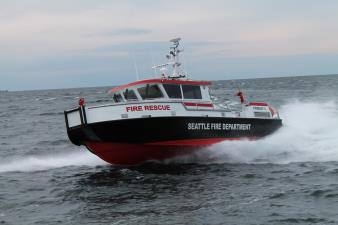 On behalf of MetalCraft Marine we would like to congratulate Seattle Fire Department on the delivery of their new FireStorm 50. We've just received another heartfelt testimonial from Deputy Chief Chris Byrne of Marco Island Fire Rescue. Hi Emily & Mike !! Just a quick note, "again"! This past weekend Marco Island Fireboat 50 responded to a vessel capsized 10 miles offshore in very rough sea conditions at sunset with reports of 5 people in the water. Other law enforcement and fire rescue vessels were unable to continue their response due to the sea conditions and returned to port. Our Metalcraft vessel easily cruised at 33 knots safely reaching and rescuing all 5 victims. Captain Bogan at the helm. This rescue followed another which occurred a couple days earlier when 3 people were thrown from their kayaks and were swept out in the Gulf by a strong tidal current taking them offshore, our vessel arrived and rescued all three of these victims found a mile offshore. I share these experiences with you in hopes that when shared with all the employees at Metalcraft they understand what an important member of this lifesaving team they are, as without this quality vessel our firefighters would be unable to do their job. 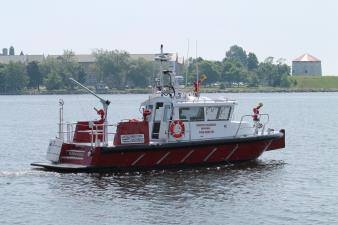 We continue to be extremely busy on the water and are impressed daily with our exceptional fire rescue vessel. Please extend our gratitude to all!! Here are details of Marco Island Fire Rescue's FireStorm 30 T-Top. Here's another testimonial from Marco Island Fire Rescue by Chief Mike Murphy. You can read all our online testimonials. Spot any patterns? On behalf of MetalCraft Marine we would like to congratulate North Hudson Regional Fire Rescue on the delivery of their new FireStorm 36. On behalf of MetalCraft Marine we would like to congratulate Alexandria Fire Department on the delivery of their new FireStorm 50 high speed fireboat. Mike Schuler at gCaptain.com has posted a nice summary of MetalCraft Marine's vessels in the Port of Houston, Texas. The new fireboats, all of the ‘FireStorm 70’ model, operate as a state-of-the-art command center and high-speed response vessel built by MetalCraft. Each fireboat comes equipped with powerful quad diesel inboard engines for a top speed of 45 knots. The current fleet clocks in at just 14 and 16 knots. Part firehouse, part boat, the vessel enables the crew to stay on station for extended periods. The cabin includes a primary care berth with four secondary berths in the cuddy. Portable berths can be positioned in the aft equipment cabin to handle injuries during incident. 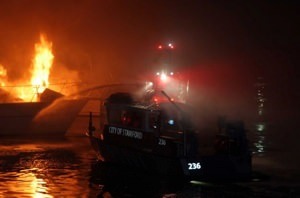 Here's a news item from Stamford, CT about a boat fire at Avalon Stamford Harbor. 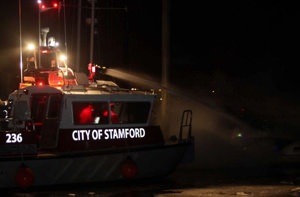 Stamford's new FireStorm 32 high speed fireboat assisted in the response. "Fiberglass is extremely noxious for us and gives off all kinds of gases." Roach said. "The smoke was spreading fairly well and we had all kinds of calls for smoke throughout all sorts of sections of the city." At least 28 firefighters from four engine companies, and a rescue and ladder truck responded as well as the city's recently purchased fire boat which was able to help block the blaze from progressing farther, Roach said. "It was a tremendous asset for us," Roach said. See the Stamford Advocate online article with 17 photos and a video of the on-site presser. And here's a diagram of the marina. From Mike Murphy, Fire Rescue Chief, Marco Island Fire-Rescue department . 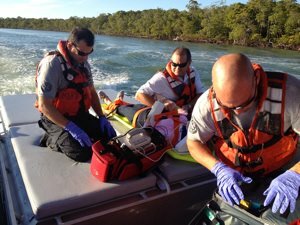 Marco Island Fire Rescue received a call at 4:20 PM on Janyuary 29th from Coast Guard St Pete requesting us to respond to a boating accident with injury at Marker 27. A boater had run aground and an individual on board sustained injuries. We initiated our MERT response and Marco island, Isle of Capri, Collier County Sheriff and FWC were notified. Because of the described condition of the patient and the shallow location, we had the opportunity to also respond with our new boat. Marco Island reached the boat and patient and was able to quickly get the patient onto our new boat and treatment area. The boat and treatment area performed as designed and the paramedics had plenty of room and were able to easily treat the patient and monitor all vitals while transporting to the awaiting ambulance. The patient was declared a trauma alert and transported by helicopter to Lee Memorial Hospital. On behalf of MetalCraft Marine we would like to congratulate Alexandria Fire Department on the delivery of their new FireStorm 30 T-Top high speed fireboat. Seating for 6, plus 5 patients on backboards. The Cornelius-Lemley Fire Department and their FireStorm 30 have been busy and in the news recently. 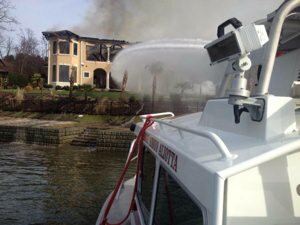 They responded to mansion fire on Lake Norman. Here's Video from WSOCTV Chopper 9. Here's another WSOCTV report about two different drownings and subsequent searches from labor day weekend. Also here's a nice video on YouTube posted by the Charlotte Observer. 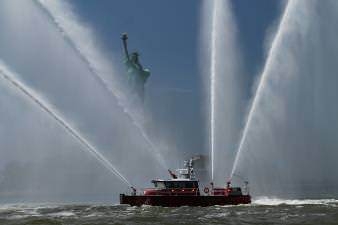 The Cornelius-Lemley FD have posted many of their fireboat's activities on a Facebook page (scroll). Here are three recent news stories about the City of Marco Island Fire Rescue Department 's new FireStorm 30. Marco Island Fire Department gets new fire vessel by NBC Channel 2 with a story, video, and photos. Marco Island Fire gets life saving piece of equipment by CBS Affiliate WINK News with a story and video. 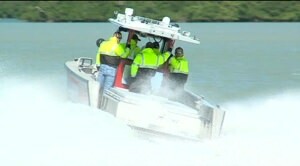 Smoother Waters Ahead: New Rescue Boat Arrives On Marco Island a story from MarcoNews.com. This is also interesting: here are presentation slides used by Marco Island Fire Rescue to justify the purchase of a MetalCraft Marine vessel. Note the role played by other satisfied MetalCraft customers in the proceess. Here's a very good case for chosing a shallow-draft MetalCraft-Marine jet-powered fireboat. 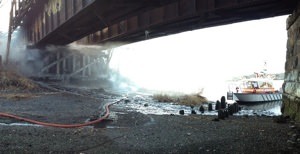 Early Friday morning Dec. 27, a blaze was reported on an old railroad trestle located off shore in the Seekonk River. Cranston Marine 2, a MetalCraft Marine FireStorm 30, assisted from the shallows beneath the trestle. The vessel provided tactical support, personnel, while providing pump water to land crews.